Lesli Hoey was faced with the challenge of giving her students access to real-world challenges that practitioners in planning fields face, despite not having access to sites and practitioners in real-time. Her class centers around example case studies with space for individual reflection and peer instruction to build their competencies before they enter the field as globally-aware and competent professionals. Along with her colleague, Assistant Professor Andrew Rumbach at the University of Colorado, Denver, Hoey recorded interviews with practitioners working in diverse projects around the world. 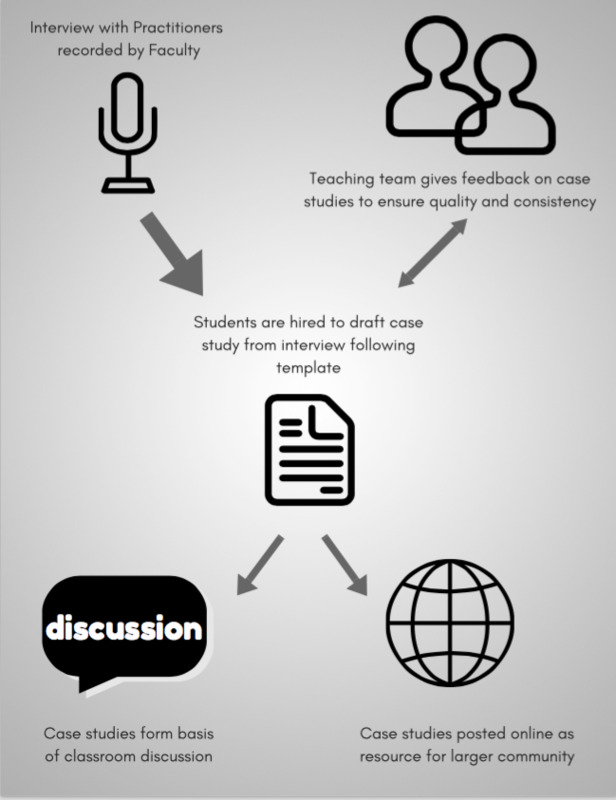 Students were hired to take those interviews and write up case studies following a provided template, going back and forth with the instructors and practitioners to make sure the case captured the story accurately. Once prepared, cases were integrated into the course with an accompanying PowerPoint presentation and contextual readings. Each case study exercise asks students to put themselves in the shoes of the practitioner, completing a Google Forms survey to choose and justify what they believe to be the “best” solution to the problem presented in the case. They subsequently work in groups to debate their answers before learning and discussing how practitioners resolved the situation. The case studies were designed to take some of the pressure off of participating practitioners who may not have the time or resources to create educational materials based on their experiences. However, it does require input from the instructor to make sure that the case studies produced are consistent. Students who have engaged in the case exercises in class are often frustrated by the initial constraints presented in the case studies. Space is given in class to imagine ideal solutions, and the discussion is linked back to the theories presented in class and the situations faced by practitioners. This allows students to challenge some of their “rose-colored glass” assumptions about the field of planning and development, while also considering what might ultimately change the political and economic factors that often curtail more sustainable and equitable outcomes. Initially, Hoey received pushback from students that the cases and outcomes presented were “depressing.” She is actively working to find more cases where international planners and developers succeed in the face of “insurmountable odds” to implement interventions that focus on economic equity, environmental sustainability, and other socially progressive outcomes. Working with her colleague, she is also developing systems so that these resources (and the diverse populations and viewpoints they represent) can be available to more instructors around the world. The solution for now is a free resource library to which access must be requested and controlled through a password-protected web portal. Students consistently point to the case studies as being the most valuable part of Hoey’s classes. Despite the often dispiriting outcomes, students express that they have been challenged to consider the skills and approaches they have to learn to improve the outcomes they achieve in their own work. The case studies are not a perfect substitution for field learning, but with limited financial resources to take students outside of the classroom or to bring in outside speakers, the case exercises still increase students’ exposure to diverse environments and practitioners.